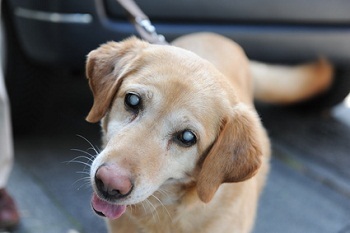 If you’re wondering what toys your blind dog might enjoy, our list of the most popular toys people have purchased from the links on our site might help you decide. 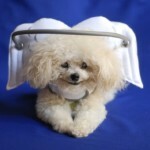 We’ve also included non-toy items that will make your life with your blind dog a little easier. By a large margin, the Pet Qwerks Babble Ball was the most popular item we’ve reviewed on our site. It comes in several sizes and varieties, including the Animal Babble Ball (featuring animal noises), Pet Qwerks Talking Babble Ball (featuring phrases like “Hey, what are you doing?” and “Sweet Puppy!”), and Pet Qwerks Holiday Babble Ball (featuring phrases like “Ho! Ho! Ho!” and “Merry Christmas!”). The sounds allow your dog to track the ball as it moves, which makes it a perfect toy for blind dogs. 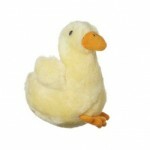 Like the Pet Qwerks Babble Ball, Grriggles Chirping Chums feature sound chips to engage your dog’s sense of hearing. 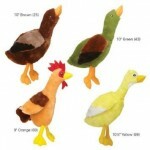 The wings of these plush toys also feature crinkly material, which is irresistible to dogs, especially those that are food motivated and associate the noise with food packaging. 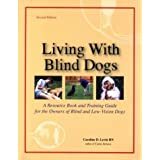 This book was recommended by our dog’s ophthalmologist and was instrumental in helping our dog (and us) adapt to her sudden blindness. It gave us ideas for how to play and to keep her safe inside and outside of our home. Most of all, it let us know that blindness wasn’t the end for our dog. She went on to adapt to the change and had little problem getting around. This product allows you to mark out points of interest in your home for your dog. It’s a smelly road map that allows them to find or avoid certain areas. Each marker lasts up to a year and you can renew it every so often by scratching it to release more scent. The scent is only noticeable to humans up close, but dogs can smell them from a distance. This would have come in handy when our Sadie was alive. She would get snippy with other dogs that approached her after she went blind and the other dog owners would let them get too close, often before we could warn them. A nice visual warning may have avoided some unpleasant situations for us, our dog, and the other dogs and owners. 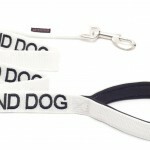 There you have it, the top blind dog toys and products. We will probably add to this list occasionally as new products become available. 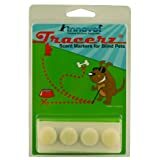 We hope this helps some of you who are struggling with getting your blind dog to play again and/or cope with blindness. If you have any of these products and would recommend them or know somepup they would benefit, please share this post!